I've been very pleased by the positive reaction to San Dimas. We have beta testers from all over the world -- the US leads the way in terms of number of beta testers, no surprise there. However, I was surprised to find out that the number 2 country is... France! This is despite both Germany and the UK having bigger eBay usage. Also, there is no translated version of the interface yet, and we have done zero press about San Dimas in France up until now. This was the first French article, and was published back in April. After this was published we saw a big spike in beta user registrations from .fr email addresses. What appears to be an in-depth review of the San Dimas features. I say "appears to be" because I can't actually be sure, since I was an abject failure in learning French, this despite my four years of French class in junior high and high school. "Pour en revenir au graphisme, moi je le trouve au contraire très bien foutu : plus classe que du html avec de légers dégradés, et surtout un écran pas surchargé du tout où l'on pourrait se perdre, comme sur la homepage d'ebay. On ne peut pas non plus le constater sur des screenshots mais la navigation est très agréable également. Bref joli test pour une jolie application !" "To return from there to graphics, me I find it very well on the contrary foutu: more class that HTML with light ranges, and especially a screen not overloaded of the whole where one could lose oneself, as on the homepage of ebay. One cannot either note it on screenshots but navigation is very pleasant also. In short pretty test for a pretty application!" "La grande force de San Dimas est à mon avis cette navigation complètement nouvelle qui casse les codes d'une page web, ou même d'une application de bureau plus classique : fini les pop-up, les rechargement : ici tout se fait par onglets ou par panneaux, profitant à merveille des technologies Flex et Air pour donner un style à part entière à San Dimas." "The great force of San Dimas is in my opinion this navigation completely new which breaks the codes of a Web page, or even of an application of more traditional office: finished the popones, recharging: here all is done by mitres or panels, benefitting wonder from technologies Flex and Air to give a style to whole share in San Dimas." I'm calling pop-ups "popones" from now on. Que sont les applications riches (RIA) ? - Partie 3 - Quel futur pour l'Internet riche ? There is a small San Dimas mention in this article, which is a three part magnum opus on Rich Internet Applications. (3 part blog post! Take that, Twitter!). What I like about this one is that it refers to San Dimas as "projet San Dimas d'eBay". I've saved the best for last. Somebody made a 17 minute (17!) video of a San Dimas walkthrough. In French. I have no idea what the narrator is saying. Can anyone help translate this? San Dimas Beta Invitations Going Out... Now! I got to show San Dimas in the keynote on Monday, and thankfully it went off without a hitch. Doing live demos on real production data with a beta product running on a beta platform is a recipe for disaster, but I wanted to risk it and show everyone the product. Thanks to everyone for the compliments, and thank you to everyone who came to my "Desktop 2.0" session later on. Also thank you to the beta users (including beta user number 1 -- you know who you are) who have sent in lots of great suggestions (and plenty of bug reports) already. We are working hard on fixing the highest priority bugs, and will push out a new build by the end of the week. One of the points I made in my session, and that I want to re-emphasize here, is that I would love for San Dimas to become a platform that third-party developers can "plug-in" to. I'll stress that this may not happen - and if it does it is a long way off. 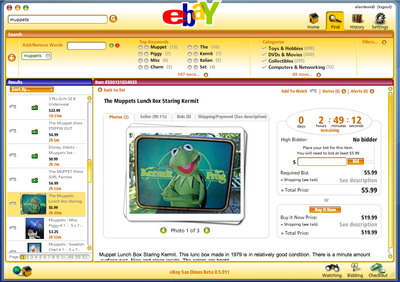 Having said that, I had great conversations with developers in Boston about things that they would like to do with an eBay desktop application, if they had the ability to extend it or integrate with it. We are busy enough working on the first version of the product, so we haven't sat down to think through what we need in the technology for allowing third parties to extend San Dimas, but now is the right time to talk to developers, so that anything we do allows developers to create things they have told us would be useful, not just what we think they should do with it. I want to continue that conversation on this blog and elsewhere. During the day 3 keynote, Pierre said that third party developers are a crucial engine of innovation, and I agree with him 100%. So, developers, if San Dimas were a platform, what would you do with it? Want to Be the First to Try San Dimas? The team is working hard on the San Dimas beta - we are feature-complete, and are in bug-fixing and tweaking mode. I can't tell when we plan to start sending out invitations, but I will say that there is a dependency on something that I'm not allowed to talk about. And whenever that dependency is cleared up and that other thing is finished it will be just about the right time to start the limited beta. Is that all clear now? I consulted on this project, which means that I was asked to some of the meetings and got to spout of my opinions without having to do any of the actual work. I think the best part about these widgets is that they really push the boundaries of offering up useful functionality without forcing you back to the website. Try the search box - it lets you search eBay from within the widget itself. 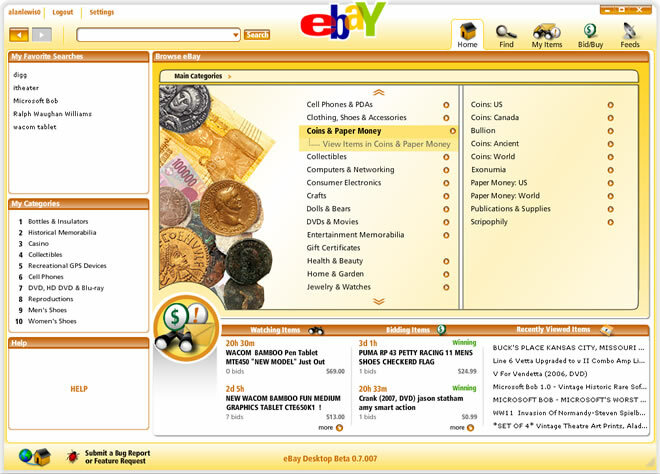 eBay ToGo (not eBay Togo - thats an island in the South Pacific) is of course built on eBay Web Services - specifically our REST API. As I point out in the Techcrunch article announcing the launch, we have some great new services that we are working on that we will be showing off at our Developers Conference in June. I'm happy to announce that the beta program for San Dimas is now accepting signups. We will send out applications soon, and the earlier you sign up , the better chance that you'll get to use it when we start sending out invitations. I'll be writing more about San Dimas on the San Dimas Blog, which is hosted on eBay's own blogging platform. I plan to write there on the features and functionality of San Dimas as we develop it, and I hope to use that blog to get community feedback on what we are building. I'll keep blogging here on occasion about the usual web services and more technical stuff. There has been a great response to San Dimas here at Web 2.0 Expo -- There has been some great press written about it recently, including Wall Street Journal and Techcrunch. Thanks to everyone who has blogged about it or signed up for the beta.